This broad spectrum of interiors draws inspiration from both the classic French decorative tradition and the freshest Parisian home designs. 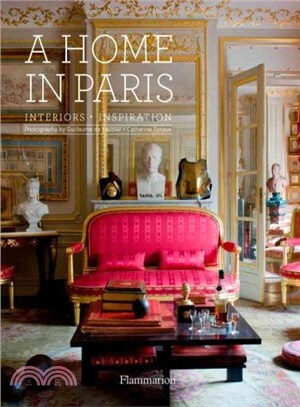 Discover the rich diversity of Parisian style in thirty-four interiors that are rife with inspiration and grouped into five thematic chapters. Classic interiors feature crystal chandeliers and gilt-framed mirrors, a marble bust flanked by eighteenth-century Louis XV rattan chairs, or floral-embroidered Chinese tapestries paired with a mother-of-pearl-inlaid armoire. Modern interiors incorporate mod Tulip chairs, geometric Calder-esque mobiles, and vibrant-hued polycarbonate dining sets. A passion for collecting comes to the fore through taxidermy, tribal arts, Slavic textile motifs, 1950s domestic design pieces, or expertly grouped photographs. Designer and artist abodes exude an irrepressibly creative vibe, from kitsch playland to 1940s boudoir lounge. Romantic interiors include powdered palettes and Provencal fabrics or plush velvet couches and a whitewashed pine buffet.Guillaume de Laubier leads us into the private realm of the Parisian design elite, chez Jacques Garcia, Vanessa Bruno, Jacques Grange, Agatha Ruiz de la Prada, Pierre et Gilles, or the late fashion muse Loulou de la Falaise. His photographs capture sleek Scandinavian lines, traditionalist opulence, modernist curves, and exotic accents, documenting each unique interior with flair. Guillaume de Laubier, a lifestyle photographer, contributed to Elle Decoration for over 17 years. His photographs regularly appear in Vogue and have been published in more than a dozen books, including Highland Living, A French Country Home, The Most Beautiful Opera Houses in the World, and Saint-Emilion. Catherine Synave, a journalist and art historian, has contributed to Marie-Claire Maison, AD France, and Maison Francaise.